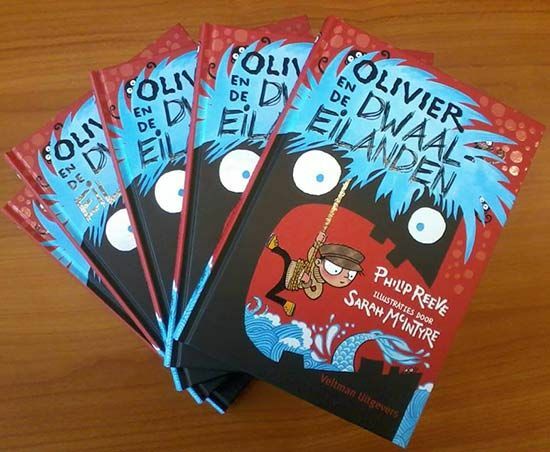 secrets of a translator: seawigs in dutch! Fortunately my illustrations translate very well into Dutch, but you don't usually hear much about the translator, and SO much about the Dutch reading experience will depend on her skill. Don't forget that page near the front with the tiny words on it... ah, there's Sandra! 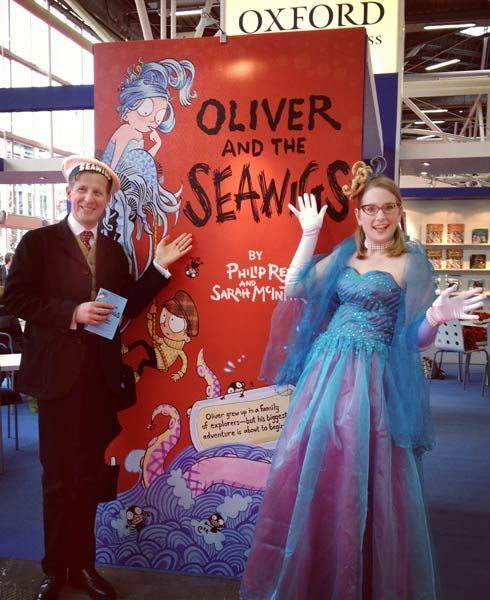 This whole foreign rights thing started when we went with the OUP gang to the Bologna Children's Book Fair (in full costume!) and you can read about that in this earlier blog post. Sarah: What were some of your favourite parts of translating Oliver and the Seawigs? Favourite words or phrases? 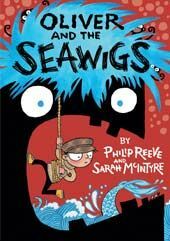 Sandra: Well, Oliver and the Seawigs was my first title for a younger audience than the YA-novels I’m used to translating, so that in itself made it a lot of fun. It contains a lot of humour that needs some finesse. 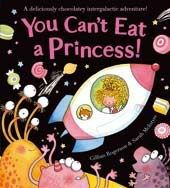 Also knowing that this would be the kind of book my kid would read in a few years’ time made it extra rewarding. I love having to come up with funny names, and I’m still quite proud of Dominique van Tastique for your very own Stacey de Lacey. I LOVE Dominique van Tastique! What were the most tricky bits to translate in the book? I can’t exactly remember the specific words, but it’s always the ones that you hardly notice when just reading a book. A certain term that carries more meaning in English than a literal translation in Dutch would or that has several partial matches only and none are ‘quite right’. Specific jokes that almost certainly get lost in translation. Or those lovely typical words that you just know the meaning of (you can see it in its natural habitat and hear it speak), and still that one translation that feels right won’t pop up in your head until you’ve squirmed for half an hour. I also pondered over Thrumcap and Dimsey for quite a while. Wondering if there was a literal meaning or whether I should choose something that sounded alike or just something that had some meaning to Dutch readers. Did you know there is a Little Thrumcap in Nova Scotia and/or Maine? And that ‘thrum’ can refer to something that’s done rather monotonously but as a noun can be bits of rope? And cap could refer to the wig, of course, so you won’t know until you dig deeper. Or tweet (once the publisher says that’s okay). You seem to get some creative license in renaming the characters. What are their new names and how did you choose them? 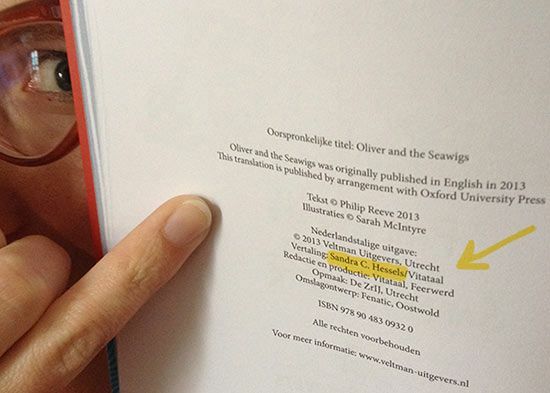 In this case, the publisher had already decided that Oliver Crisp would become Olivier Vlot (meaning both ‘quick’ (adj.) and ‘raft’ (noun)). Iris didn’t have to change. In all other cases, I read the book, make a list of names and offer as many suggestions as I can come up with, based either on etymology (whenever that’s actually applicable), sound/meaning (Culpeper was chosen for its fiery character, hence the ‘pepper’ survived) or humour (Stacey’s new last name), and usually a mix of these. What's your first language, and how many languages do you speak? I’m a native Dutch speaker and a near-native English speaker (thanks to a love for the language, reading, university and of course television, haha). At my grammar school I also took German, French, Latin and Greek. Yup. Did a course in Irish once at university, too, since I get to brag. But my German has ebbed away (in spite of being fifty per cent Austrian, but that’s a dialect and so not the same) and my French is more than rusty. The others were never more than passive to begin with. I'd say that's pretty impressive, all the same! 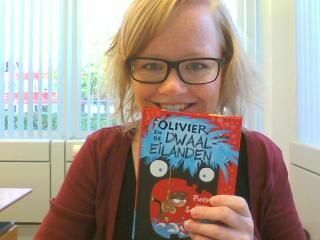 Other than Oliver and the Seawigs, what's the most fun or exciting thing you've ever translated? Ah yes, Monster and Chips by David O'Connell and John Dougherty's Stinkbomb & Ketchup-Face! ...that are just so very different from what I’ve done before. 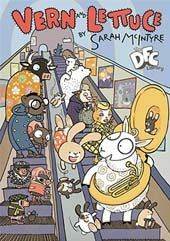 They have a wholly different style and sense of humour, for a different audience, which makes them almost an entirely different ballgame that’s exciting and fun in its very own ways. Especially since I know I’ll read these to my son as soon as he is old enough. Our Seawigs editor, Saskia Kalter at Veltman Uitgevers. 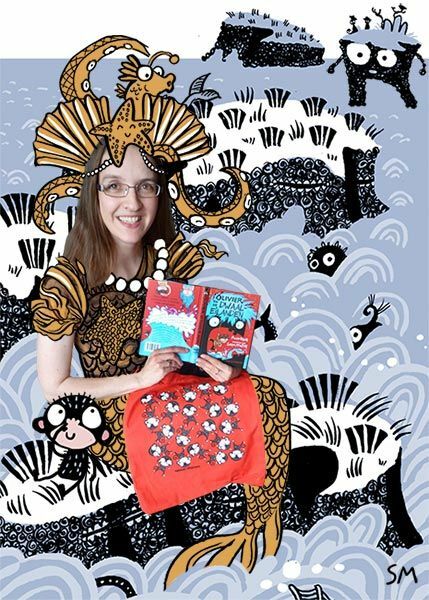 Saskia was the one who commissioned the Seawigs activity sheets from me! What's a standard working day like for you? Do you have a standard working day? It’s standard in that I work whenever my son is asleep – so I’m completely at his mercy (he’s two and a half now). I started translating as a freelancer in 2012, after quitting my then day job at a magazine publisher’s so that I could work from home and be with my son, which is absolutely a great combination. A bit of a time crunch now and then, but I wouldn’t have it any other way. Do you have an interesting top tip or two for other people who are thinking of going into translation as a profession? Read, read, read. In the language you want to translate from and into. Get a relevant education – I studied English, not translation – and background (work experience), even if that means starting out just translating a friend’s website or a brochure for a merchant down the street. Thanks so much, Sandra! And to Saskia and all of the Dutch team! If you have any questions for Sandra, you can find out more from her website, and chat with her over on Twitter. And you can order the Dutch version of the book through the Veltman Uitgevers website. Edit: 30 Sept is International Translation Day! Read more about translation in this Huffington Post article: 10 Ways Translation Shapes your Life. Brilliant to read this - and very funny too, coming at it with a knowledge of Dutch. Very glad to have discovered Sandra via you,sarah, I shall be keeping an eye out for her now! 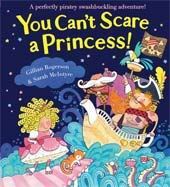 I did wonder about the quote from Riddell - won't they be getting quotes from notables in the Dutch children's literature scene? 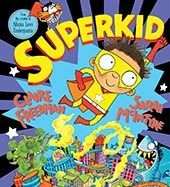 It just struck me as a bit odd (though understandable) that next to Chris' name there is an explanation about who he is ( " a successfull British children's author") - surely with quotes you want to persuade the audience that the book is brilliant, and with quotes a lot of that comes from the authority of the person making the quote. 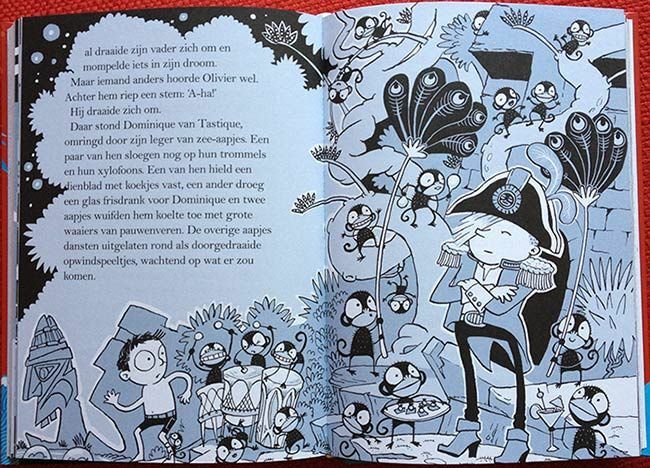 So whilst Riddell's quote works brilliantly for UK fans, if you have to explain who Riddell is, wouldn't it be better to get a well loved Dutch author (or blogger eg http://mevrouwkinderboek.nl/) of MG books to give a quote? Not a criticism at all, - just an observation. Getting a book quotation is an interesting thing in itself. I was asked awhile back by an author to provide a quote for a back cover, and when the publisher sent me a review copy, I read the book very carefully, took notes, and gave what I thought were good quotations. 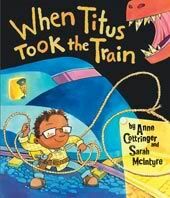 But I never heard anything from the publisher or the author again, and the quote never appeared. That made me quite sad, as I'd spent quite a lot of time to get it right! I didn't know the author at all, and he didn't know me, so maybe it wasn't as important to him that the quote appear anywhere. 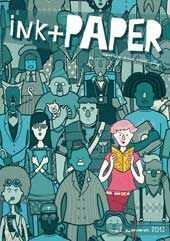 But the experience made me more inclined to save my time for writing comments about friends' books I like, and not bother with books by people I've never heard of. (I can always review them later, on my own blog, if I really like them.) That might be a common experience. I am really, really keen to get hold of some peep boards. Who made it? Where is it? Who do I beg? Oh! What is a peep board?